I really want Wille to have a fleet of Jet Alones in Final as a counterpoint to Nerv's olive drab Eva posse. The JA can finally redeem itself, and Khara can fill the movie's gratuitous violence quota with lots of JA on Eva Drone carnage! Eh. Reticence is good, but some of the characterization reads like a checklist of complaints from an anti-Wille thread. Sailor Star Dust wrote: What do ya need me for, Driftking? A leaked script by the Japanese studio Khara wouldn't be posted in English either way... Fake for sure, claims of leaks are nothing new for the NTE series (so many forum posts about this sorta thing over the years). Khara's been super secretive about New Theatrical Edition throughout the years, to boot. Fuyutsuki in Wille's company when he's supposedly with Gendo is suspect too. It all reads like a fanfic script. Kensuke cameo was hilarious. Yeah, the Kensuke bit made me skeptical, and I got you mixed up with Sakura. Sakura's found script on the last page probably has a fake source, but where on Earth would the JA be going that it takes 90 days to get there? Even at a plodding pace of 50mph (for a robot), it could circumnavigate the Earth about four times. What the heck is a Reticence? And am I reading vague mentions of a leaked Final script out there cause that's 100% a fake. Khara has this project locked down tight and nothing is getting out unless they want it too. Gendo'sPapa wrote: What the heck is a Reticence? Reticence is a 3.0+1.0/Final fan fiction that does a fairly good job of ending the Rebuild series. More of a "what if", but it's pretty good. Reticence is what you read if you want more fighting than my equivalent offering gives you (and in that regard I admit it's probably somewhat closer to what we'll get). My ancient pre-3.0 release fic which is in here somewhere tried to wrap up 3.0/Final nicely...But it was of course not knowing what we do now about 3.0. Wow, I thought my early 2000s Sailormoon fics felt old, now these do! pwhodges wrote: Reticence is what you read if you want more fighting than my equivalent offering gives you (and in that regard I admit it's probably somewhat closer to what we'll get). Reticence kind of takes the "Everybody hates Shinji" myth a bit too far IMO, though. Lennik wrote: Reticence kind of takes the "Everybody hates Shinji" myth a bit too far IMO, though. It takes a lot of things too far, honestly. 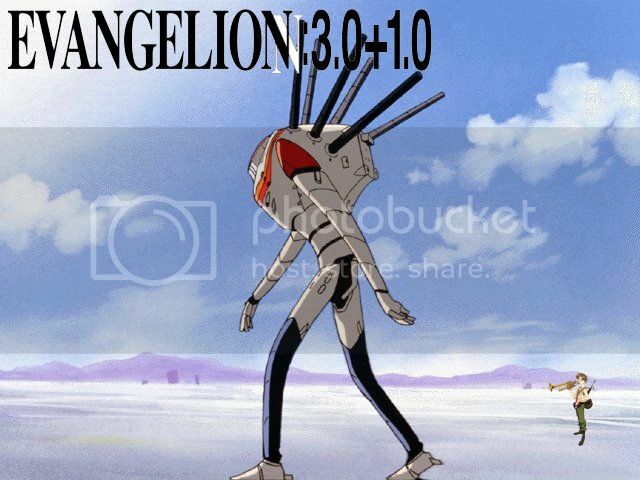 I can't imagine 3.0+1.0 will look anything like that. Yeah, the Wunder eating those MP Evas to evolve was taking things a little too far and I didn't like the way Rei Q's character development was thrown under the bus by having Rei II reformat her. I'm not too worried about any of the Children dying except maybe one of the Reis. I'm more worried that Misato is going to pull a Captain Nemo and sacrifice herself and the Wunder to disable one of Nerv's weapons so the others can have a chance to escape. Turning her into Nemo 2.0 was a great callback and made sense as a direction for her character, but it also sent up a pretty big death flag. BlueBasilisk wrote: I'm not too worried about any of the Children dying except maybe one of the Reis. I'm more worried that Misato is going to pull a Captain Nemo and sacrifice herself and the Wunder to disable one of Nerv's weapons so the others can have a chance to escape. Turning her into Nemo 2.0 was a great callback and made sense as a direction for her character, but it also sent up a pretty big death flag. Considering how she went down in EoE, I'd say that she had a moderately sized death flag hovering over her to begin with (as does the world for that matter). Although at the very least I hope she's not going to have to sacrifice herself for Shinji again. Killing Misato for Shinji's sake wouldn't pack the same narrative punch since their relationship is so different in this version. It'd just be one more thing for Shinji to feel guilty about and somewhat redundant since he thinks Kaworu died because of him. I feel like 2.0 and 3.0 deliberately cleared away the lingering death flags from EoE. Asuka gets mauled by an Eva and survives, Rei gets absorbed by an Angel and survives, Misato and co. survived the JSSDF invasion of Nerv. Kaworu still died but the circumstances were different and he brought that on himself. The movies repeat the theme of living through hardship and learning to cope. Can't do that if everyone's dead. By that logic, Rei didn't die in NGE either. ^Well, no she just self destructs her Eva to kill the Angel in NGE. Literally just did my rewatch of NGE and her death in Eps 23 isn't the same as her being absorbed at the end of 2.0. She isn't around sure, but we are told she still exist in the Eva with Yui by Fuyu during 3.0. My point was that Rei, in 2.0, actually DOES die. She's been eaten and digested. She has no body of her own. She's dead. (Her soul still being active doesn't negate this, considering so many cultures have in place contingencies for post-death spiritual activity. Ghosts, for instance.) If dying and then having your soul moved into a vessel that's still alive means you "survived" (= never actually died), then, logically, Rei 2 in NGE didn't die either, since her soul was promptly moved into a new body. You could say that NGE!Rei survived even better than her NME counterpart, since at least she got her own body which she can autonomously control, and isn't trapped in the core of an Eva that already had someone in it.